The notion that the Rana Plaza factory collapse came out of the blue and took everyone by surprise is sheer fiction. The companies who sell these clothes have known for a long time that there are serious problems with the working conditions in the factories they use. But talk about addressing those issues is about as cheap as the clothing they sell. One year ago, more than 1,100 people died needlessly. More than 2,500 other people were injured, a great many very seriously. Why did these things happen? Was it a freak and unforeseeable accident that couldn't be avoided? Was it an isolated incident that promises never to happen again? Was it the sort of accident against which we have safeguards, but for which one minor oversight had tragic consequences? No, none of these things are true. The collapse of the Rana Plaza factory in Bangladesh was predictable, preventable, and wholly prejudicial. Put bluntly: garment factory workers in Bangladesh died on April 24, 2013 because we like cheap clothing and the companies who sell that clothing don't really care about the welfare of the people who make it. You never would have known the callous calculation in which these companies had engaged when this story broke. As pictures of the collapsed building and the bodies of workers in the rubble started to make their way around the Internet and into newspapers, shock, awe, and remorse were the only expressions we heard uttered. Every CEO involved was "devastated" at the loss of life. They were "overwhelmed" by the scale of what had happened. And they "vowed" to do right by the impacted families and Bangladesh's entire garment industry. Never mind the fact that those workers had expressed grave concern over massive cracks that had appeared in the building just one day earlier. Nor that those workers were coerced back into an all but certain death sentence by an employer who threatened to withhold a month's pay from them if they did not return. Of course, what's a month's pay when you're the CEO of a billion dollar company? The rest of us; however, can at least roughly grasp just how devastating that threat would be, though we do not live in the challenging conditions that these workers endure. Never mind that organizations like the Clean Clothes Campaign, the Maquila Solidarity Network, the Workers' Rights Consortium and many labour unions had been running campaigns for years addressing the very pressing concern around worker safety in Bangladesh factories. 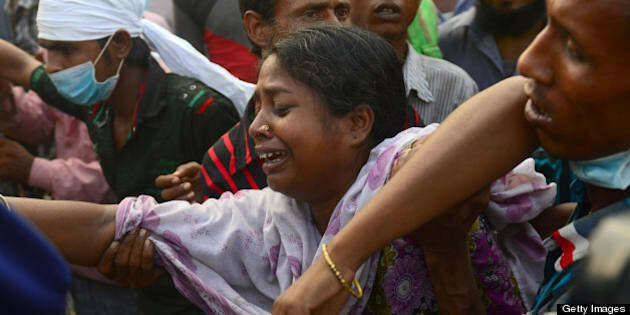 Nor that only five months prior, more than 100 garment workers died and more than 200 others were injured in a factory fire in that very same region of the country. Those workers died because the building did not have emergency exits and the existing exits were too narrow to fit the rush of workers once the flames broke out. More than 100 people burned to death in a building for want of way to get out. But the incident "only" involved a couple hundred Bangladeshi workers, so little media attention was paid and the involved companies effectively did nothing to address the issue. The notion that the Rana Plaza factory collapse came out of the blue and took everyone by surprise is sheer fiction. The companies who sell these clothes have known for a long time that there are serious problems with the working conditions in the factories they use. But talk about addressing those issues is about as cheap as the clothing they sell. It is all too easy to say that you care about the suffering of others and then turn a blind eye to solutions that would actually address that suffering - usually with lame excuses about cost and inefficiencies. Some of those companies have signed on to the Bangladesh Accord on Fire and Building Safety and that is genuinely a good thing. The Accord requires that inspections of factories take place to ensure the deaths I've mentioned don't happen again. Though going is slow on those inspections, as only about 300 of the 1,600 factories covered by the Accord have been inspected in the last year. And don't get too kind-hearted towards these companies thinking that they've finally turned the corner on this issue. In addition to the Accord, the other major promise that they made was to compensate the families of workers killed or injured in the collapse. Have they fulfilled that promise? Once again, talk is cheap - and so are these companies. A trust fund has been set up through the International Labour Organization with the goal of collecting $40 million in assistance for Bangladeshi families. To date, only a fraction of that money has been contributed. The one thing in this unfortunate story that is not cheap is human life. Indeed, human life is precious, whether you are a super rich CEO or a factory worker in Bangladesh. On April 24, 2013, the world became much poorer when we lost more than 1,100 human lives for reasons that were known and could have been prevented. A handful of employers let greed get in the way of preserving the safety of the people they employed. Let us not forget that this is the crux of the story in Bangladesh. And let us also make sure that these companies are made to pay for their greed and the pain and suffering it has inflicted on Bangladeshi workers.